Inland ship captains prefer the confined river and its banks to the vastness of the open ocean. But make no mistake, by no means is the river an easy ride and concentration is key when hauling cargo on a busy river to its destination. Lack of focus or experience can prove disastrous for your precious vessel, its cargo and your reputation. This new Inland Vessels campaign will guide you through some of the challenges an inland vessel captain faces. 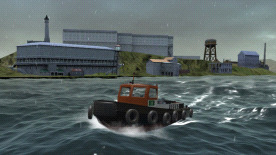 Enhanced gameplay functionality, including 5 Controllable Barges.